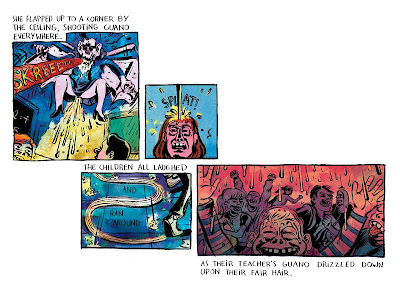 Rob reviews the new comic by Nicholas Breutzman, Shaun Feltz and Raighne Hogan, YEARBOOKS (2D Cloud). Nick Breutzman is an artist I've been vaguely aware of for quite some time. I know he was part of the CRITICAL CITADEL crew and he had the strongest story in the latest issue of up-and-coming anthology GOOD MINNESOTAN. On the basis of that story, I was excited to hear about his first book, YEARBOOKS. Breutzman drew it and co-wrote it (with Shaun Feltz), while Raighne Hogan did the colors. This is more of a novella than "graphic novel", given its length (40 pages) and overall concision in its storytelling. The one word that describes Breutzman's stories best is "dread". He has a way of coming up with an atmosphere of impending doom and pain that is more tense than any actual depiction of horrific deeds. 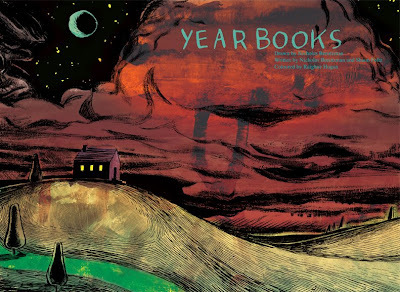 YEARBOOKS has a look and feel that seems to borrow from a number of sources, yet eventually come up with a perspective that is entirely Breutzman's. The coldness of the narrative reminds me a bit of Dan Clowes. The slightly grotesque and exaggerated depiction of the characters is not unlike Lauren Weinstein, down to the vivid (and deliberately garish) color scheme of Hogan. The dream sequences remind me of the sort of thing Dash Shaw might do. However, Breutzman's view of humanity and the way people interact in high school is far more grim and unsparing than any of those artists; if anything, he has more in common with filmmaker Todd Solondz. There's a similar distrust of the motives of all people, but especially those in authority. The book begins with a creepy dream sequence featuring a teacher turning into a bat-creature and shooting guano all over them, as the skies outside darkened ominously. We then meet Ryan, a teen near the bottom of the brutal power hierarchy that is high school as he negotiates a particular day. He has an odd but compelling bond with his art teacher, who starts to show him some truly disturbing work from earlier in his career. He had avoided showing them to his acolyte until Ryan started to think he was a poser and started to avoid him. Ryan starts to get a hint as to what his teacher is all about when he sees the merciless eye that created these drawings from life, but it isn't until he sees his teacher with his best friend and starts to put together the nature of their relationship that the full horror of what he saw sinks in. We then cut back to the dream from the beginning, whose portentious tones have given way to all-out disaster as children are drowned in a schoolhouse thanks to actions by the teacher. One reason why the story was so effective and chilling was that there was no resolution beyond Ryan's newfound understanding of a situation he didn't want to know anything about. Instead, we slip directly back into a nightmare sequence. Part of the horror of what's implied at the end for Ryan is the level of trust he had in this teacher and the way he identified with him. This was someone Ryan wanted to emulate, wanting to know more about his life and career. The teacher was resistant to this form of connection because he knew that he wasn't really a worthy choice as a mentor, but was desperate to create some form of validation for his career (and as a human being)--and recast a younger artist in his own image. It was telling that whenever Ryan started to non-judgementally raise certain moral issues related to the art, the teacher became defensive and even witholding. When the full picture of his teacher started to coalesce, it was as much a judgment on Ryan's own choices as it was on the teacher. Breutzman's visuals tell the story effortlessly. 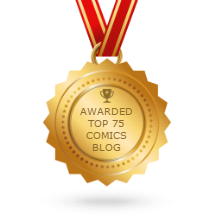 His character design, body language, use of gesture and unusual placement of panels give the reader subtext and a richer understanding of the story's ultimate emotional resolution. Breutzman also raises an interesting issue vis-a-vis the relationship between an artist and their responsibilities as a moral agent in the world. Can art be evil if it's made by predators, or is this entirely in the eye of the beholder? These questions are raised but not explicitly answered, but what is unquestionably true is that the experience brought an end to what was left of Ryan's innocence. It's one thing to survive high school when you have the carrot of college waiting at the end and a new life. It's quite another when you've been told that the person you want to become is a monster--and it may be too late to stop. Nice review, I just got sent this to review as well. Will have to get on it pronto!